This project provides accommodation for 174 students in single flats over 5 floors with ground floor office/accommodation facilities including laundry, and external student social area. 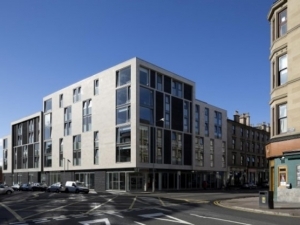 A central high efficiency plant strategy is being employed to provide heating and water services to all flats, which will include sub metering of heating, water and power to give a BREEAM ‘very good’ rating. Included Lifts, smoke control ventilation, localised heat recovery within bedrooms, centralised door access/intercom, TV/Comms infrastructure, CCTV, fire alarms, emergency lighting, general lighting and power.